You always want to look your best, but if there’s one day in your life when you want to absolutely glow with radiant health and beauty, it’s your wedding day. All eyes are on the bride….and not just those of your husband-to-be and assembled friends and family, but also those of the photographer and videographer, who will comprehensively capture every detail of your special day for posterity. This, then, is the day when nothing must be left to chance. This is the day you call in the pros. Suzanne Morel Face & Body Care has the pros, from Suzanne Morel herself–raised in a family of beauty salon owners, and founder of her own cosmetics line–to her talented staff of hair and makeup artists. Suzanne trains her hand-picked beauty squad personally, with refreshers throughout the year to keep up with the latest hair and makeup trends. 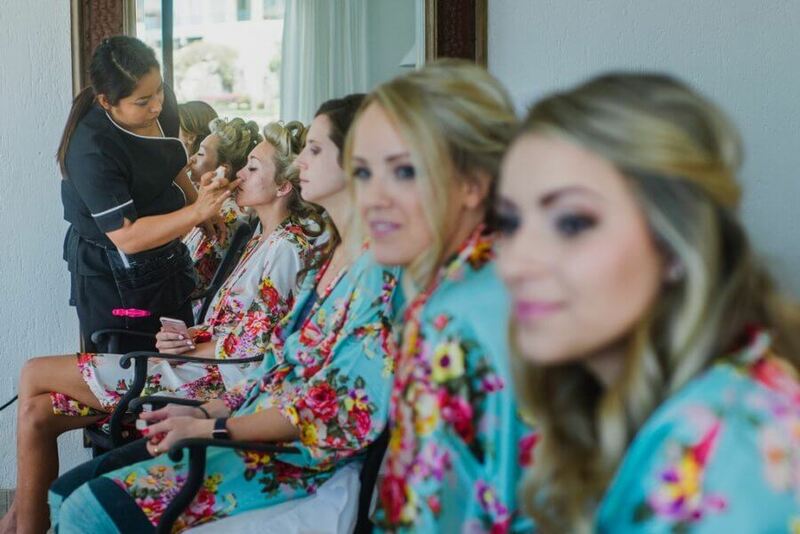 Together, they comprise the finest team of beauty stylists in Cabo San Lucas, and are considered a must hire for elegant destination nuptials in the Land’s End city. But you don’t have to wait for your wedding day to get the benefit of their expertise and many years of experience. 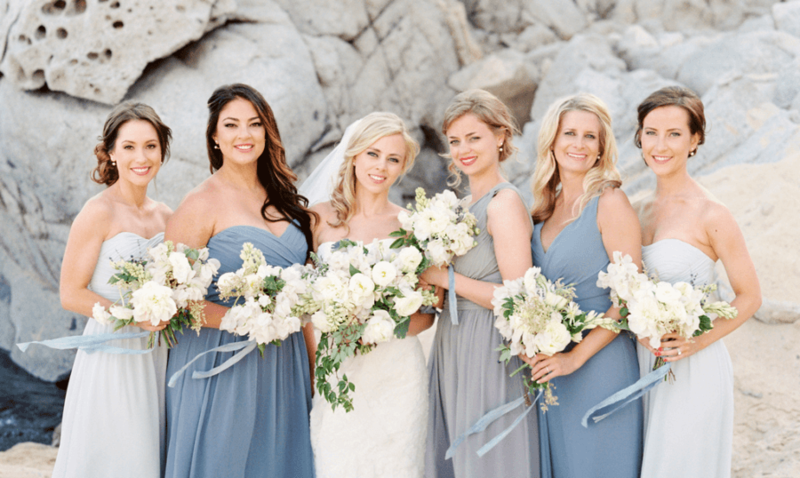 In today’s blog, the pros at SMFBC answer some of the most frequently asked hair and makeup questions for weddings in Cabo. 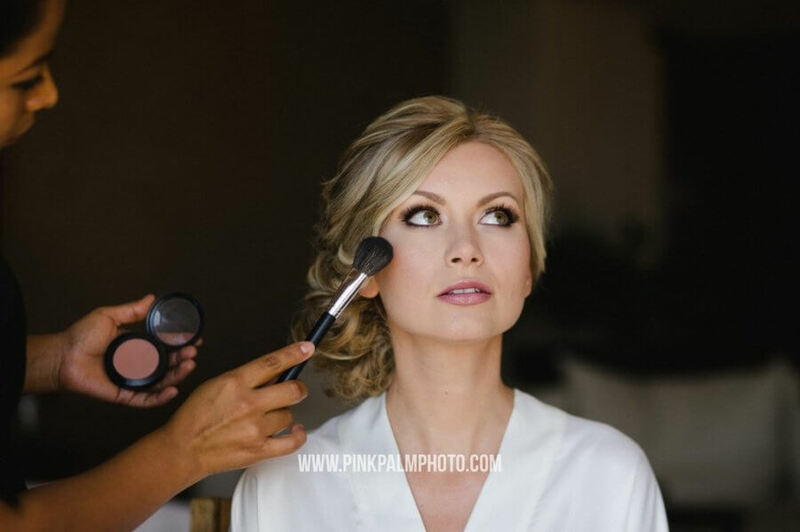 What are the biggest benefits of hiring a hair and makeup specialist for my Cabo wedding? Well, for starters, it’s one less thing you have to worry about. 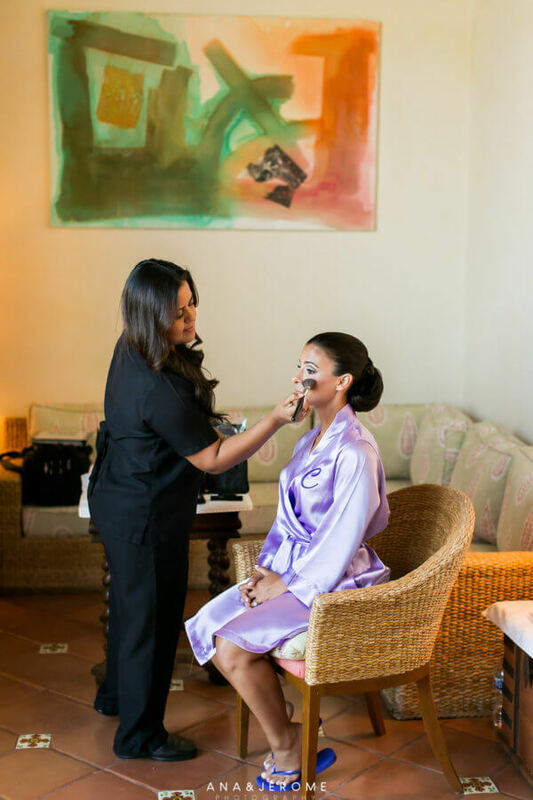 There’s enough going on in the lead up to weddings in Cabo, and especially on the big day itself, that the last thing you want is to be worrying about is whether your hair and makeup are perfect, or are still perfect a few hours into the festivities. When you hire a wedding beauty stylist–and in our case we typically dispatch a team of bilingual hair and makeup ladies to take care of the entire bridal party–then that’s one super important area you never have to worry about at all. You are all going to look amazing, because that’s what we do! But it’s very important that brides-t0-be explore all their options beforehand. Find out what’s available, and understand that the least expensive option is not necessarily the best. It’s like any aspect of the wedding planning process. You need to have a vision of what you want, and be able to communicate that. Because at the end of the day, those photos and videos are going to be around for the rest of your life! It’s not enough merely that you look fantastic, but that you photograph that way too! Photoshop isn’t going to help if something goes wrong with your hair. For us, a phone or in-person consultation is a necessity. We want a chance to bond with our brides. We need to listen to them and understand what they really want. It’s an important relationship and we take it very seriously. What is the ideal wedding hairstyle? That depends in large part on the wedding dress and its neckline. For the more traditional, regal style of bridal gowns with high necklines, an updo is definitely a great look. We love a chignon for those sorts of situations. It’s chic and elegant, it works well with accessories, and it really shows off your face and neck to great advantage. It’s a classic wedding hairstyle. With plunging necklines or off the shoulder gowns–and we see a lot of the latter for weddings in Cabo because of the warm tropical climate–down-dos can look really striking and glamorous, and of course we can play with braids or curls or tresses to see what really pops in terms of a “wow factor” hairstyle. A lot depends on your own natural look and style, but the dress and the setting too are absolutely going to be major influences. How much makeup touch up will be necessary throughout the day? This too is dependent on a number of factors. Is it an indoor wedding or an outdoor wedding? 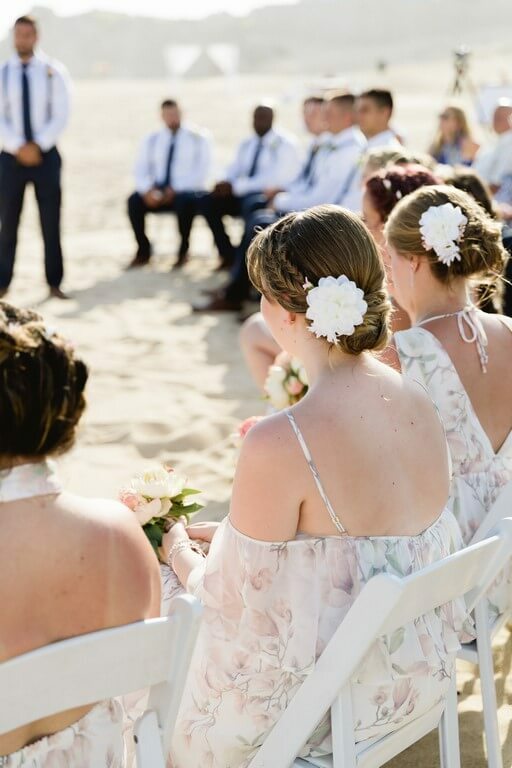 Often times “weddings in Cabo” are essentially both, with a lovely outdoor ceremony on a local beach, for instance, followed by an indoor reception at a resort ballroom or similar venue. And of course those are two totally different makeup situations. Cabo San Lucas is in the tropics, meaning the sun is very bright, very powerful. There’s a very specific way we approach makeup in an outdoor setting–foundation, eye shadow, lipstick–knowing from years of experience what will work best in terms of how you look and how you photograph. And even within those basic guidelines, we also have to factor in your own skin tone and coloring, the time of day, and even the specific setting. Being in the desert, for example, is subtly different than being by the Sea of Cortez. It’s so specific, really, that it’s hard to generalize. A lot of touch up can be required, or only a little if, say, you’re in an indoor venue with consistent lighting the entire time. But both are fine because we’re there with you most of the day, and we’ll do however much or little is necessary to keep you looking fabulous. That’s the important takeaway. Not only do we give you a complete hair and makeup styling to start the day, we’re with you throughout the ceremony and into the beginning of the reception. You have your own beauty team squad, ready to swoop in at a moment’s notice! 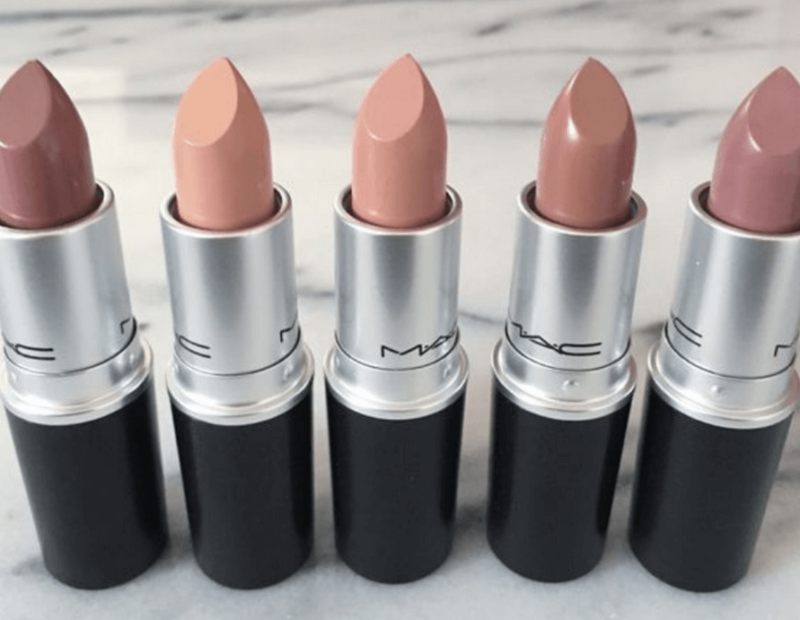 How coordinated should the bridal party be in terms of hair and makeup? The bride, obviously, sets the standard for everyone in the bridal party. She shines brightest, but bearing that in mind, it is of course possible to have similar dresses, hairstyles and makeup for the bridal party. Be careful, however, of trying to match too closely. That’s often difficult to manage with different hair types and hair lengths. What are the most important things to remember in terms of the hair and makeup timeline? It has to be a focus, and you have to make sure enough time is budgeted not only for the bride, but anyone else who needs to be styled and made up, from bridesmaids to flower girls to mothers of the bride and groom. We have a team, so we can add more hair and makeup artists as needed to make sure everyone is taken care of in the amount of time available. So that’s a key, but we also like to remind our ladies to have fun! Have a glass of champagne! Enjoy the moment! The big moment is yet to come, of course, but this one is special too. You’re with people you love in a very special place at a very special time. Weddings in Cabo San Lucas are a once-in-a-lifetime event. Savor every moment! 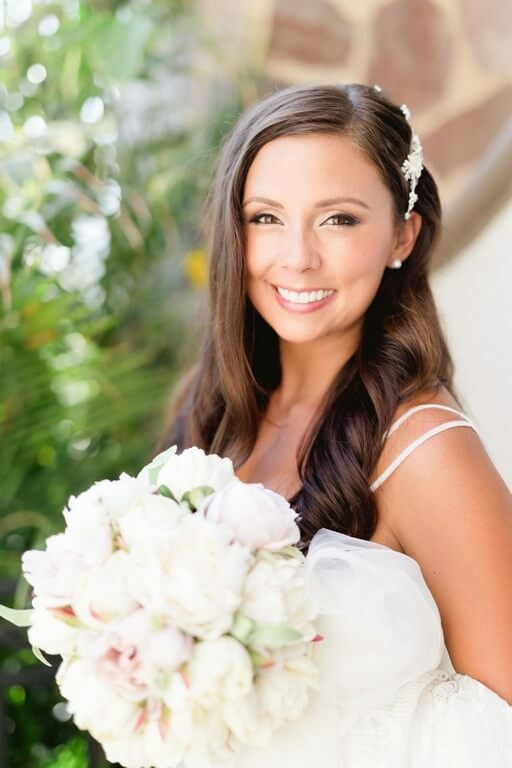 This entry was posted in Blog, Cabo Bridal Hair and Makeup and tagged Cabo San Lucas Destination Weddings, Hair and Makeup Tips, Weddings in Cabo.